Editor's note: Today’s guest blog comes from Dan Mesh, Vice President of Technology at Evite, the pioneer in online invitations and social planning. Evite has over 30 million registered users and sends more than 250 million party invitations annually. In the past year, we’ve introduced a couple of exciting new products at Evite: our Postmark service offers premium online invitations and announcements for milestone events like weddings and births, and Evite Ink lets our users design custom paper invitations that we print and mail for a small fee. We couldn’t have launched these products without Google Compute Engine and Google App Engine, which gave us the infrastructure needed to scale our services to high demands and analyze large volumes of data they generate. Evite has been around since 1998, but behind this well-known online brand is a small and lean team. Migrating to the cloud has allowed us to focus our time, energy and financial resources on development of new products and services, free from worries of server management, capacity planning and hardware costs. We chose Google Cloud Platform because the combination of App Engine and Compute Engine truly delivers on the cloud’s promise of scalable and elastic computing. 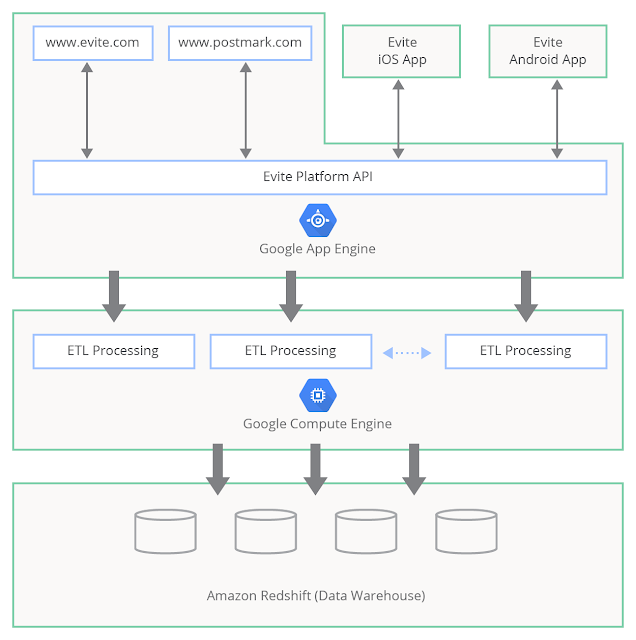 App Engine’s autoscaling means that as long as our applications are developed in line with the platform API’s and architecture guidelines, scalability comes for free. This is a huge benefit since we no longer worry about scaling our services to meet heavy demands and are also free from the difficulties and risks inherent in capacity planning. Most online businesses have very consistent daily, weekly and seasonal traffic patterns, and in Evite’s case, these patterns are even more pronounced. In the past, we used to provision resources to meet peak demand allowing for a healthy margin of error and future growth. Naturally, this resulted in a lot of wasted capital and engineering resources. Now that most of our systems are running on Google Cloud Platform, we see significant savings as application servers expand and shrink elastically in accordance with our web traffic. For example, in the past Evite was hesitant to roll out major application releases in Q4, typically the busiest time of the year for us. During this time, we reach our peak traffic, and operational focus was on making sure nothing went wrong. Any significant releases represented unwanted risk. Cloud Platform greatly simplifies the release process and provides built-in traffic splitting. This has made it possible for Evite product teams to test new features and release products more frequently and with reduced risks, even during the busiest times of year. As we add new products and services, Compute Engine plays a key role in our application infrastructure. We use it to closely monitor and analyze the performance of our products and services. 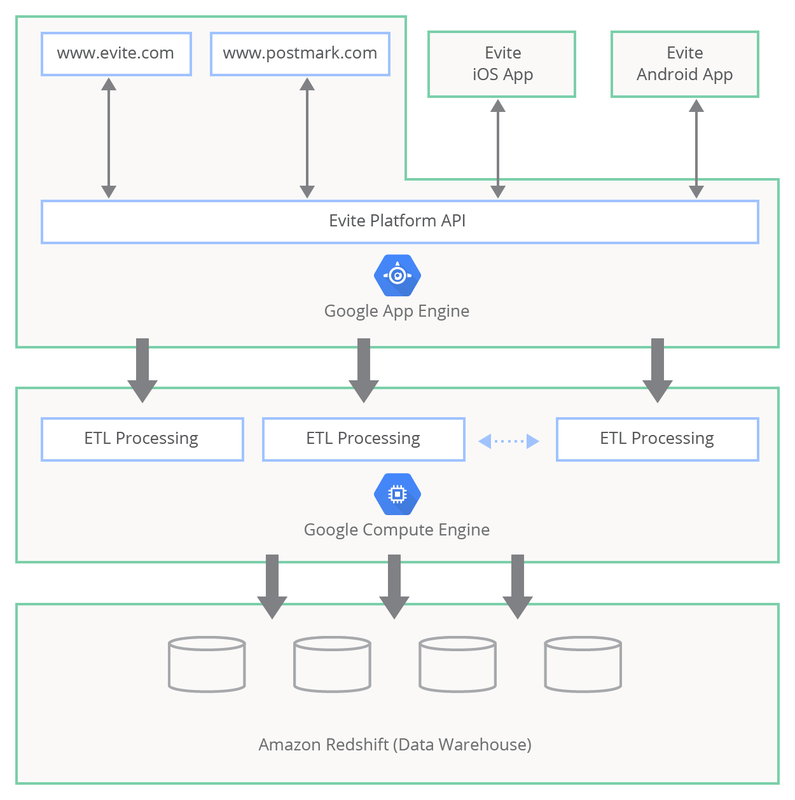 All application data and log files generated by applications running on App Engine flow through a cluster of Compute Engine instances running extract, transform, load (ETL) processes, which feed this data into the data warehouse. There we analyze the collected data to detect errors and usage patterns helping us improve the design of our products and maintain performance levels. Compute Engine gets high marks for interoperability with App Engine and other cloud vendors. We use AWS Redshift as our data warehouse so interoperability is very important. Equally impressive are predictable, high I/O performance and fast instance startup times. For our data processing workloads these two metrics are critical to success. With App Engine powering all of our customer-facing services and Compute Engine helping us monitor and understand application performance, Evite is in great shape to create and release new products. We look forward to many new releases in 2014 knowing we can count on Cloud Platform to make these launches trouble-free.